There is something about old fashioned pen and paper that I just plain love. I love the feeling of laying out a fresh sheet of quality stationary and a good pen, ready to drink some hot tea as I splash some sentimental feelings across the page to a faraway friend. I imagine classical music playing in the background, and I most definitely include raindrops splattering against the window in this mental picture. And then I remember that I live in Las Vegas, and raindrops only splash against the window pane during monsoon season, and actually its less of a delicate splash and more of a torrential, frightening flash flood-type rain that pounds against the windows. My point is that I was looking through this website called Minted, and I was dreaming of beautiful stationary. And boy, did I find it. 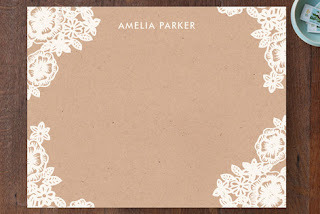 Like this adorable personalized note card. And something I had not seen before - this incredibly sweet children's stationary!